There is not a single hobbit who does not know who Bullroarer Took is! So I won't explain how he helped win the Battle of the Greenfields and invented a new game at the same time! March 17 is Bullroarer Took Day and we will gather to pay tribute to our Great Hero and to all the victims of that brutal war. Let's gather again, like we did previous years in Brockenborings, near the Bullroarer's statue. There will be music and dancing, drinking ofcourse, and some local lad insists on giving a demonstration of his fence-running skills during the entire evening. There will be no Hobbit Market that day, but according to Miss Nimelia, tools will be for sale for those in dire need of a new one. Monday 16th is a market day, and a better opportunity to get the tools, jools, and more, that you need and your chance to buy a nice new garment in the Bullroarer's favourite colour: GREEN! 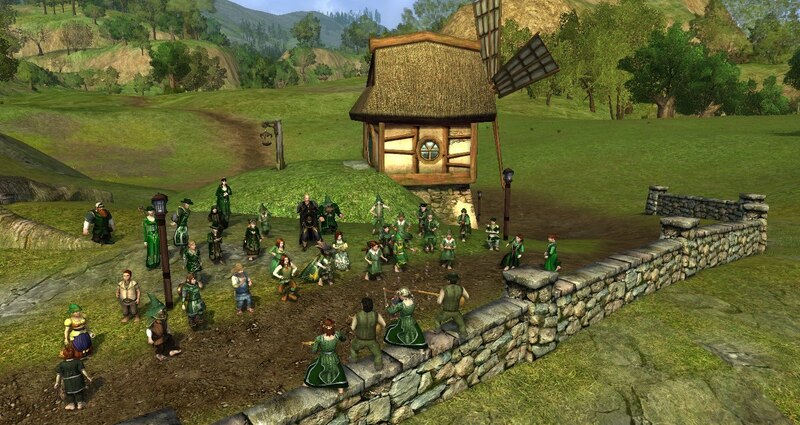 Tradition has it that hobbits dress in green on Bullroarer Took Day. So, even if it is not your best colour, do the wearing of the green!! The music will be performed by several bands and soloists. Bands have already signed up spontaneously and are catered for, but we are still looking for more Lone Bards to perform in the intermissions and at the afterparty. If you are interested you can write to the Gazette or go to the special Lone Bards Friday on March 13th at the Green Dragon, where a talent scout may approach you and invite you to come and play on the 17th. But best is to take action yourself. What: Bullroarer Took Day celebrations, with music, dancing and lots of green-clad people. Where: Brockenborings, near the Bullroarer's statue. Another tradition is that after the performances, we go inside the Plough and Stars for more poetry, music, more dancing and more drinking. It will be open stage in front of the fireplace for all of you who wanted to, but have not played yet.